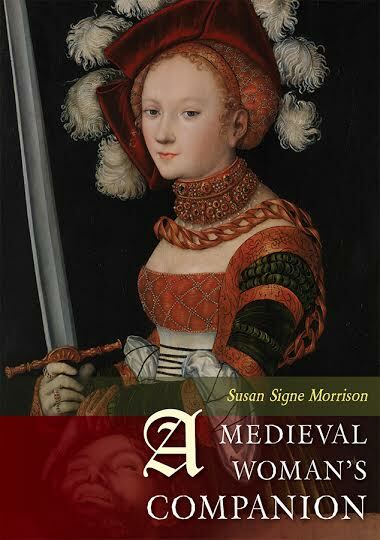 I recommend checking out these websites about the Middle Ages and medieval women. Internet Medieval Sourcebook at Fordham University is a highly recommended scholarly source, including actual texts from the Middle Ages, as well as historical information. http://www.fordham.edu/Halsall/sbook.asp. A basic bibliography of writings by and about women in the Middle Ages. The actual testimony of the heretic Na Prous Boneta. A letter to Eleanor of Aquitaine. http://www.fordham.edu/halsall/source/eleanor.asp. A Medieval Woman’s Companion. The website and blog accompanying this book. https://amedievalwomanscompanion.com/. Feminae: Medieval Women and Gender Index. This wonderful site allows you to search for non-book sources (reviews, journal articles, etc.) according to topic or author. Medieval Feminist Forum. This site allows you access to articles that have appeared in the Journal of the Study for Medieval Feminist Scholarship. http://ir.uiowa.edu/mff/. Home page for the Society for Medieval Feminist Scholarship. http://smfsweb.org/. Comprehensive Bibliography of Medieval Queens and Queenship. http://theresaearenfight.com/. A good general site is http://www.medievalists.net/. Educational and fun films about the Middle Ages are at YouTube. Index of Medieval Medical Images. http://digital.library.ucla.edu/immi/. Find out about Brigittine nuns. http://birgittaskloster.se/en/. For more about Hildegard: http://www.abtei-st-hildegard.de/?page_id=11. For more on Hildegard and how she is inspirational to a modern audience today, visit http://healthyhildegard.com/. International Joan of Arc Society. http://faculty.smu.edu/bwheeler/ijas/. You can friend the International Marie de France Society on Facebook. You can find out lots about Margery Kempe, including her pilgrimage routes, here: http://college.holycross.edu/projects/kempe/. Resource for the study of women’s religious communities from 400 to 1600 C.E. http://www.monasticmatrix.org/. A comprehensive discography for Hildegard: http://www.medieval.org/emfaq/composers/hildegard.html. More recordings become available all the time. Check YouTube for performances and music. Discography for early women musicians. http://earlywomenmasters.net/cds/index.html.